Over lunch yesterday, my officemates and I got into the topic of children in Maguindanao being trained to kill at a very young age. It was told that, at age 12, kids are taught to have no mercy and to kill without remorse. And if they suddenly grew a conscience and refuse to kill those they were tasked to exterminate, the kids have to exchange their conscience for their life. So, everything comes to just one choice: they kill or they will be killed. Not a good set of options right? The talk about these kids being trained to kill people led me into thinking that what a blessing it is that I was born into a life, an environment, and a family in which I did not have that kind of dilemma, the dilemma of having to choose between my life or another's. I am blessed to be born into a life that opens different opportunities for me to excel, to dream, and to be happy. I am blessed to be born into a relatively safer place with no ongoing war, no soldiers constantly on the move, no fear of continuous gunshots and grenade bombings. I am blessed to be born into a family who gave me a baby doll for a toy and not a baby armalite, who let me run with my playmates and not run after men to kill, who taught me my ABCs and not how to dislodge a grenade. I am indeed blessed. How then can I be not thankful for the life given to me? Have you watched the movie Blood Diamond? It's a very touching movie...i felt like crying, again...huhuhu. What a very very very sad world, really. 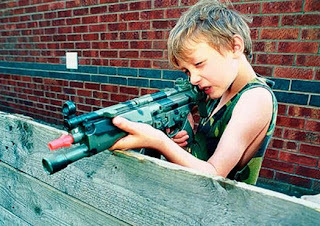 I have a child of my own and could never imagine, ever to have him hold a gun at an early age. Can't even imagine him being a hitman in the future, huh. No way. I'd rather die first! nope, haven't seen it, but is that the one with Leonardo di Caprio in it? nice job with you kid. yep, violence, any form of it, should never be introduced to children. Yep, Leonardo Di Caprio is a very good actor. He spoke in a different accent in that movie. It's a true to life story movie. Watch it. ah really? Hmmm.. hope it's on HBO, so I can catch it. Happy new year!